Madia elegans D.Don ex Lindl. was new to me when my wife and I moved here over seven years ago. In fact, it was a surprise to me even a few years after we had been living here. It is an annual species native from Southern California north into Western Oregon and perhaps into Washington. The flowers are sensitive to sunlight (or is it temperature?) and respond by closing during the day, only to open after the sun is setting. It is believed that the flowers do this to conserve moisture (prevent the nectar and pollen from drying out, floral segments withering, etc). It was for this reason that I never noticed them, during the day all you can see are the closed buds. The plants are also covered with resinous hairs that help the plant retain moisture, an important adaptation since they bloom during the hottest part of the year over a long period, roughly starting in July and going til early September in my area. Back to my discovery, it just so happened that for a few years I had not ventured out into the field at or before dawn, so when I decided to go for a walk at the crack of dawn one morning I was in awe of what seemed like a magical phenomenon. I had thought, where had these come from? It was perplexing. Madia elegans, known as common madia or tarweed (in reference to the odor of the resinous excretion on the stem and leaves), exhibits a great deal of variation in flower forms, plant height, bloom period, number of florets per inflorescence, and number of flowers per plant. They can grow anywhere from six inches to over sixty inches when grown in rich soil and given water, as is the case where I have sown them in garden beds. I would suggest if you are planning on growing these, and I have seen seed available online, that you provide stakes or other plants for them to lean on. The flowers themselves smell of honey, and are probably rich in nectar as evident by my recurring observations of bees on the flowers. In the evening, after the sun drops below the horizon, but before the sky goes dark, the flowers start to open. The petals (ray florets) unroll from the center. I have observed few pollinators visiting them at this time, though I have seen a few solitary bees visit at dusk on warm days. Small moths were often present, but I've never seen them land on any of the flowers during a handful of brief observations. I still wonder, do the moths visit the flowers after dark? Probably not so much, I am convinced from three years of observations that bees are in fact the primary pollinators. During the day, the flowers appear as unopened buds. The petals are rolled up, and green hairy bracts protect them from drying winds and the heat of the sun. They do not protect the flowers, however, from blister beetles in the genus Epicauta, found on many of the flowers day and night. The small half-inch-long Epicauta beetles linger on the flowers all day, eating the ray florets as they unroll in the afternoon/evening. Perhaps the beetles seek mates and do the deed itself on and around the flowers, something I have observed on the nonnative Daucus carota which shares the field with the Madia and flowers simultaneously. Blister beetles are toxic and have been known to give people contact dermatitis when contact to human skin is made with some genera in the Meloidae (blister beetle family). The chemical cantharidin, a poisonous terpene than works by breaking the connections between cellular tissue resulting in blisters, is secreted by the beetles. The amount of the toxin produced by the beetles varies greatly depending n the genus, species, and whether it is a male or female (males produce more). I cannot attest to the toxicity of the genus Epicuata, nor do I intend on testing it for myself. Deformed flowers like this are encountered frequently, though new flowers open just as frequently. The fact that blister beetles eat the petals doesn't discount them as pollinators. There have been cases where certain plant species will still set viable seed even after their beetle pollinators eat the petals, parts that are nonessential to seed formation, but instead useful for initially enticing pollinators to visit. However, I do suspect that the chemical cantharidin produced by the beetles must interact with any pollen the beetles inadvertently pick up on their bodies, and I would suspect the interaction to negatively impact the viability of the pollen, though this is based solely on instinct. Bees are considered by most to be the primary pollinators of the genus Madia. I can attest to that, during several observations over the past three years bees were the main if not the only floral visitors in the mornings before the flowers closed for the day. Very early in the morning, it may be possible to find some solitary bees, motionless, sitting in the flowers, probably from the preceding evening. Males of some native bees can occasionally be found sleeping on the flowers, as they build no nests to sleep in and instead hang out at the flower looking for a hot date. Halictus bees dig their nests in flat ground and then line the brood cells with a waxy secretion from a special gland at the tip of their abdomen called the Dufor's gland. They are eusocial, meaning they are often solitary in the beginning, then first generation daughters remain in the nest to care for the young (as with honeybees). Depending on the species, a nest may have a single queen and a few workers, or they may have many queens and hundreds of workers in an extensive underground colony. I suspect the climate may also play a role, where food sources are scarce it may be more adventitious to be more or less social. Additionally, cooler climates stimulate solitary behavior while warmer climates motivate eusocialism. The flowers of Madia elegans open towards the sun, so bees that spent the night warm up quickly in the morning light. I have found several types of bees perched on the flowers early in the morning, unable to move since the temperature was yet too low. Having pollen readily available attracted this small syrphid fly, a Sphaerophoria sulphuripes female. Like many syrphids, Sphaerophoria seek plants with aphids to lay their eggs on. The larvae then seek out and eat the aphids, possibly several per day. Syrphid flies also eat pollen, and are considered important pollinators. An adventitious crab spider awaits a meal, a small bee or fly. According to Bugguide, Mecaphesa schlingeri is only found in California. I have now seen this spider two consecutive years, always on yellow flowers (once on Madia and now on Coreopsis). Honeybees work the flowers too, to my delight! They visit for both pollen and nectar, spending a generous amount of time on each inflorescence making sure to work every floret. The honeybees spend more time working these flowers than the native bees, suggesting to me that they are either not as efficient at collecting the goods as the natives or not adapted to the local predators, or both. Madia elegans may be a very underrated bee plant worth getting to know if you are a beekeeper due to the fact that its natural habit is to grow in large swaths, and that it is worked judiciously by honeybees during what most beekeepers call a dearth. The closely related Madia gracilis has also been worked by honeybees (and halictid bees), though it is likely to be less common than M. elegans. I have not found honeybees to be interested in M. citriodora, though I have only observed one population that was dwarfed by a larger population of M. elegans. Compared to the honeybees, the long horned bees (Eucerini, so called for the long antennae) spend a few seconds on each flower at the most. Male solitary bees do not provision nests, so do not collect pollen like the females (who gather pollen to feed to their young). Pollen takes less time to collect than nectar, which would account for the quick visits of the females. To collect pollen, a bee must only be required to slam itself into a flower and wiggle around, something aided by sonication or buzz pollination. To collect nectar, focus must be directed to sending the proboscis down the floral tubes, therefore not paying attention to the pesky photographer. Some bees, like the long horned bees and others, collect nectar very quickly as well. To take some of these photos of Melissodes, I had to point the camera at a single flower and wait. Fortunately, the bees were very active and it took less than ten minutes to snap these photos. Due to the intensity of light in the morning coming from the East, it is crucial to stand in either a SE or NE position to take decent quality photos of pollinators, especially bees. Standing in an easterly position blocks light, and standing in a westerly position means you are staring at the sun. The issue with Madia is that they tend to face the sun, so if you, too, are facing the sun chances are you cannot see the faces of the flowers, thus you cannot see the bees. The genus Melissodes is composed of about ninety-seven species, eight of which are in the United States. The can be found in nearly every state as well as Canada, and perhaps Mexico. They are all ground nesting bees, as are all eucerine bees. This is a common trait of native solitary bees here in my area, the vast majority being ground nesters. For the last three years, I've observed male Melissodes bees motionless on the flowers early in the morning. I was able to take the inset photo using my smartphone camera. The recurrent years photos with bees were taken between six and eight o'clock in the morning, thus the increase in bee activity and relative difficulty in photography. During a recent observation, I witnessed a mating event in which a foraging Eucerini female was, in human terms, raped by a scandalous male. The event was very brief and did not allow me the time to point the camera and focus. This is common in the world of solitary bees, and perhaps other American social bees (like bumblebees) where females mate while foraging. I have witnessed this with a few solitary bee species. Once I witnessed a pair of mating bumblebees, the female laboriously foraging on the flowers of a redbud tree (Cercis canadensis) while the male presumably passed his genes, one last rumpus before breaking off his member inside of her and bleeding to his death (true story). This photo marks the sole incident in which I observed Agapostemon on Madia elegans, not to say there aren't a vast variety of other bees which work these flowers. This is a male, evident by the behavior and the lack of scopae, or pollen carrying apparati. Late in the flowering period, I saw less bees visit the flowers, yet a few skippers were common per observation. I hypothesize that they are less efficient at pollinating the flowers, which I believe to be geared more towards bee pollination, yet butterflies probably do account for some seed production. Rather than spreading pollen by their bodies as with bees, butterflies and moths transfer pollen which adheres to their proboscis or sometimes their feet. On occasion pollen is transferred by the bodies of large Sphingidae moths visiting flowers with exerted stamens such as some species of Oenothera. Not often considered as pollinators, plant bugs (true bugs in the family Miridae) are another insect found to be interested in Madia. It is unclear whether they effectively contribute to pollination, though they are found on many different types of flowers from those in the Asteraceae to Narcissus to Convolvulus. They are often found in small groups or congregations which is a clue that they may be seeking either shelter, mates, or both. They feed on nectar and perhaps pollen to some extent, though the latter is purely conjecture on my part. I am not sure if they frequently move between flowers, yet Madia may be self compatible (pollen from one floret transferred to another in the same inflorescence) so the possibility is valid. If it hasn't become clear, I love this plant and all of its beneficiaries. Working for a commercial beekeeping operation, I often hear from other beekeepers about the dearth this region experiences after the blackberry bloom concludes. Starthistle (Centaurea solstitialis), another noxious and invasive alongside the blackberry, is highly acclaimed by local beekeepers as the last good nectar flow. I cannot speak with certainty, but it would appear that Madia elegans is at least one native that is perhaps highly underrated for its usefulness to both beekeepers and the native pollinators that are still active at this time of year. 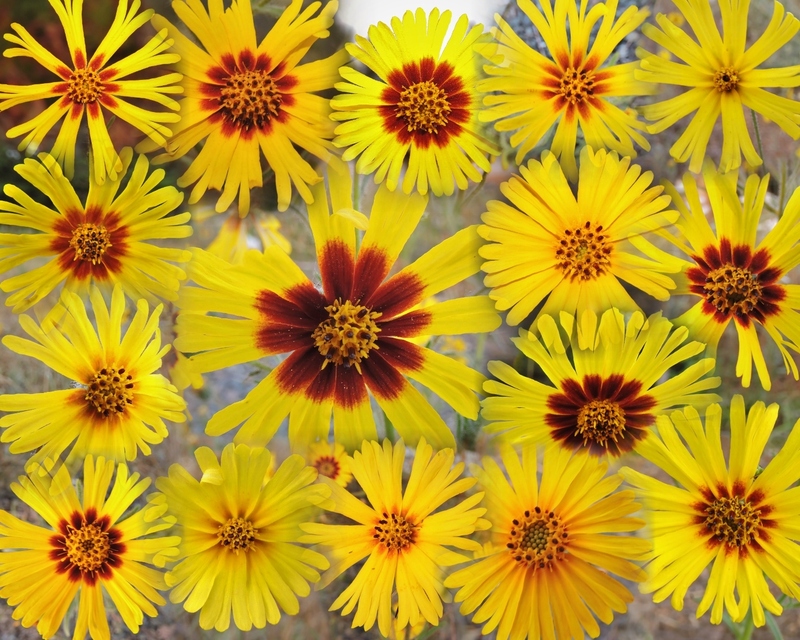 Madia grows where it can become very dry, and copes very well I might add, and also spreads to form large populations. 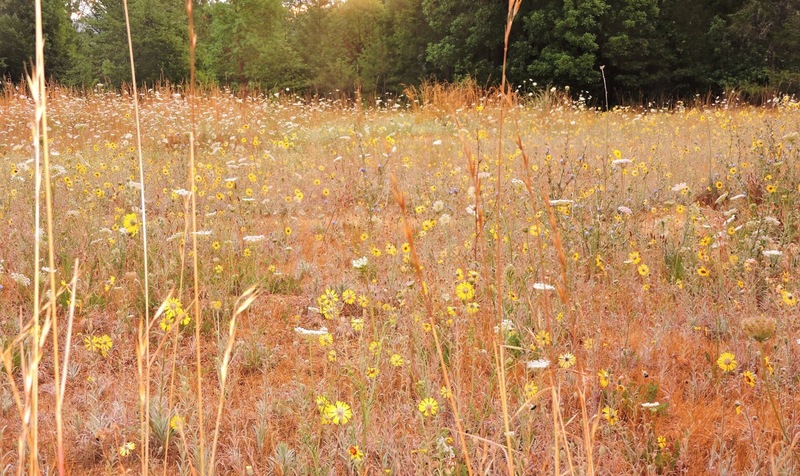 Identifying and preserving Madia elegans may go a long way towards helping the local and nonnative pollinators, which will be good for everyone and everything alive around you. thank you for taking the time to write and photograph this. So much to be learned from your article and images. I often think of gardeners as being more careful observers of nature, compared to the general population. But really, weather geeks, those into geology, birds, bugs, the natural world in general, all of us, fascinated by some aspect of nature, all are and have much to share with each other as well as at least the more patient of others out there. Prior to your blog I hadn't even heard the term 'anthecologist'. Thanks for taking the time to do these posts! A great write up and nice pics! I volunteer caring for a native plant garden in Oakland CA where we have a lot of Madia elegans which happily reseeds each year. We also get a high diversity of bee life even in ultra urban Oakland. Yellow faced bumble bees, ultra green sweat bees, honey bees and many others, including some leaf cutters and ones too small or too fast for me to casually ID. These are GREAT plants. Beautiful and easy to grow with great eco benefits. We water them about 2 times a month(!) in the dry season and cut them down to about 18" to get a whole second round of blooms. We are planning to start growing them at another nearby public garden that is mostly hybrid roses, but doesn't get much bee activity. Mary Jo, This is really useful information. I will start cutting mine down as well. I noticed they had new growth on the ones that were "lying down" so I could see how they could put out new blooms. You say, "Compared to the honeybees, the long horned bees spend a few seconds on each flower at the most. Male solitary bees do not provision nests, so do not collect pollen like the females (who gather pollen to feed to their young). Pollen takes less time to collect than nectar, which would account for the quick visits. To collect pollen, a bee must only be required to slam itself into a flower and wiggle around, something done quickly and without much aim required. To collect nectar, focus must be directed to sending the proboscis down the floral tubes." I think you are saying that pollen collection is quicker than nectar collection, correct? But you also say males do not collect pollen, which is true. Since you say pollen collection is quick, and nectar collection is slow, why are male bees so quick? After all, they still have to send their proboscis down the floral tubes, which takes time. Correct? Also, wouldn't pollen collection, especially packing it in corbiculae or scopae take considerable time for the female? I always thought female bees spent more time on a flower due to all the collecting and packing of pollen they do, vs a male that just drinks nectar and leaves. Thank you for your thoughtful comment. I had written this article last year, and revised it to reflect my observations from this year. Clearly, I had overlooked some details, and I appreciate your observations here. For honeybees, a pollen visit may be quicker than a nectar visit (personal observation), although this must vary between flower species. Many solitary bees, however, are quick no matter what they are collecting, though this depends largely on the family (another personal observation). As for packing pollen, the strategies between honeybees with corbicula and solitary bees with scopae are different when they collect pollen. Solitary bees don't pack their pollen with nectar, but rather opt to cake themselves with it. Honeybees and bumblebees use a bit of nectar to press the pollen into the corbicula, and they sometimes do this in flight or will visit several flowers for pollen before landing somewhere else (like a leaf) to groom and pack the pollen. Travis, I had no idea there was a name for this activity; thank you for providing one. I observe my Madia every morning as I eat my breakfast here in San Mateo, California. I have many unidentified flower fly visitors in addition to the Melissodes. The most entertaining are the large carpenter bees who always cause the flower heads to bob with their weight. My question is about your statement on why the madia close in the middle of the day. I had assumed that it was to conserve moisture in their nectar as well but couldn't get anyone to verify that. Do you have a source for your supposition? My in-laws lived in Rogue River so I am familiar with that area. It is beautiful country. You and your family are lucky to live there.